Update 2014/09/21: New version of the build script creates more inodes in root filesystem. The Ubiquiti EdgeRouter Lite is a neat little device that costs less than US$100, has three Ethernet ports, and can run FreeBSD/mips. It's based on the Cavium Octeon CN5020 platform and features a dual core 500mhz MIPS64 processor, 512MB RAM, and 4GB storage on removable USB. 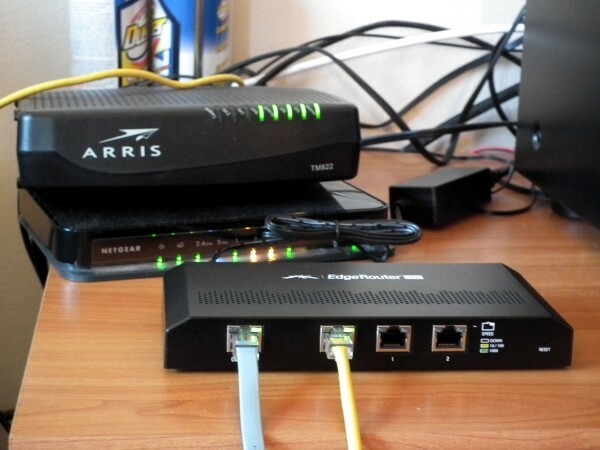 The EdgeRouter Lite in the foreground, near a Netgear WNDR3700 and a bulky ISP-provided cablemodem. This page provides ready-to-use images of recent FreeBSD releases. Thanks to the open nature of the EdgeRouter Lite, it's very easy to install and use these images; just follow the instructions below. Thanks to the fine folks at the FreeBSD Project, building your own is almost as easy. A script to build them, along with instructions, is also provided. Special thanks is due to Juli Mallett and Warner Losh, without whose hard work and generous assistance none of this would be possible. Note that this is experimental software which comes with no warranty of any kind. These builds are works in progress and are not fit or suitable for any purpose whatsoever. By proceeding you assume all risks. Performance could be a little better, though it's more than adequate for my home Internet connection. Basic packet passing between two Gigabit hosts seems to top out at about 250Mbits/sec. There is currently no way to pass boot options (such as single-user mode) to the kernel from U-Boot. Hardware crypto acceleration via /dev/crypto seems to work. Use AES in CBC mode to see a huge speedup over CTR. You can also easily build your own image from the FreeBSD sources using the provided mkerlimage script, then return here to continue with installation. The EdgeRouter's Lite on-board storage is a removable USB drive. Installing the image is just a matter of opening the device, taking the drive out, writing the image to it, and putting it back in. The EdgeRouter Lite with the cover removed. Inside is just a board. The removable USB storage is on the right. Configuring the bootloader afterwards only takes a minute, and then you're done. If you haven't already set up a serial console for your device, though, you'll need to do that first. 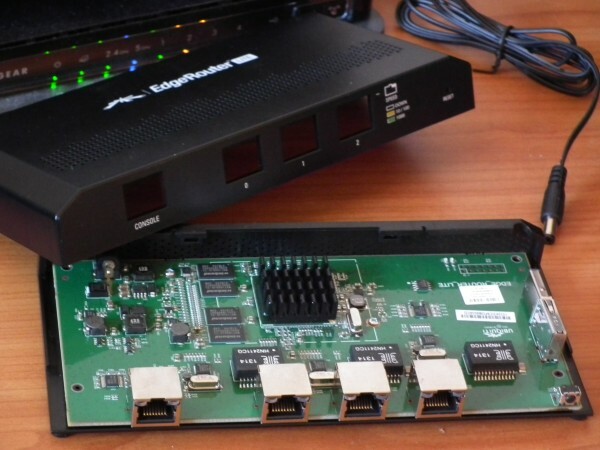 You may wish to skip to the next section if you already have a working connection to the serial console of your EdgeRouter Lite. The serial console allows you to interact with the device's firmware before boot, which you will need to do to configure it to boot FreeBSD. Since you'll need it anyway, the provided images don't enable the ssh server by default, and you'll log into your new FreeBSD system for the first time this way, as well. First, connect the RJ-45 console cable to the port marked "Console" on the device. Connect the other end to a 9-pin serial port on your computer if you have one; otherwise connect it to a USB-to-DB9 adapter, and connect that to a USB port on your computer. On other Unix-like systems, you can try building minicom from source. On MacOS you can do that or try to install it from Fink. On Windows you're on your own; try RealTerm. Determine the name of the serial port you're using. On FreeBSD systems, USB serial adapters will have names like /dev/ttyU0 and hard-wired serial ports, /dev/ttyu0 with a lowercase 'u.' On Linux systems, the equivalent files are /dev/ttyUSB0 and /dev/ttyS0, respectively. If you have more than one, the number might be greater than '0.' On Windows, it's usually called COM1, otherwise COM2, COM3, and so on. On MacOS, it might be /dev/cu.usbserial; look for other /dev/cu. * files if not. Configure the software to use the port, with settings 115200 8N1 and no flow control. Those are usually close to the defaults, but it's important to get them right as accidentally leaving flow control enabled or another error could leave you with a partially or not at all working connection. To configure minicom, enter the command minicom -s as root, then navigate to the "Serial Port Setup" menu. Start the software and plug power into the device. You should see the EdgeOS Linux kernel boot and ultimately present you with a login prompt. If your device was already powered on, just hit the Enter key once or twice to get a new login prompt. Type something at the login prompt to verify that your connection is working properly. For example, you can log into EdgeOS (the default user and password are both ubnt) and run the halt command to shut it down and prepare for installing FreeBSD. Unplug the device completely and open the plastic case by removing all the screws. Notice the lone USB port containing a removable drive on one end of the board. You can use your fingers to take the drive out, but it's a little slippery, so you might need to use your shirt for grip. It turns out there's a benefit to wearing shirts around the house, after all. Plug the drive into your computer. For FreeBSD, Linux and other Unix-like systems, the command to write the image to the drive is below. You'll need to download the xz software for MacOS or if it's otherwise not installed. On Windows, which doesn't have dd, you're on your own; try the Ubuntu Image Writer (you'll also have to download xz). Determine the device name assigned by your system. On FreeBSD, it will be something like /dev/da3, where the '3' will be the first available number after all your other SCSI and USB drives. On Linux, it will be something like /dev/sdf, where the 'f' will be the first available letter after all your other ATA, SCSI and USB drives. On MacOS, it will be something like /dev/rdisk1. If these commands produce no output, and you're certain you have the device name correct, proceed with the following command as root, substituting your device name and the filename of the image you downloaded or built. Warning: a simple typo in the device name can wipe out your system's boot partition. Check carefully before hitting the enter key. This will take a few minutes. When finished, remove the drive and put it back into the EdgeRouter Lite. Reconnect the console cable, ensure your terminal software is running, and plug power into the device. At this point, you should be looking at a fully booted multi-user FreeBSD system. One of the first things you'll want to do is expand the filesystem to use all the free space left over on the drive after you wrote the relatively small image to it. You should be able to see much more available space in the second df invocation. Enter the reboot command to reboot back into multi-user mode. Change the root password, edit the /etc/rc.conf file to set up networking and services, and refer to The FreeBSD Handbook for system administration basics. Update 2017/03/08: device pf and pflog added to default kernel config. Also available via git with change history. Update 2014/09/21: the latest version here fixes the problem of too few inodes, first spotted by Maximilian Präger. To build your own version from the FreeBSD sources, you will also need a computer running the same version of FreeBSD you wish to build. If your FreeBSD version is too old, a newer source tree's buildworld may fail. I recommend first building, installing and booting the same version of the source on the build system as you plan to cross-build for the router. Refer to The FreeBSD Handbook for more information about obtaining FreeBSD sources, the buildworld process and updating your FreeBSD system. Even if you use another OS, you can install FreeBSD inside a virtual machine, and use it to build a version of itself for your EdgeRouter Lite. If sys/mips/conf/ERL doesn't exist, creates a simple one based on the OCTEON1 configuration. Sets TARGET=mips and TARGET_ARCH=mips64, then invokes buildworld and buildkernel to build the base system and kernel. Invokes installworld and distribution to install the newly built system to a temporary root. The FreeBSD build system stores intermediate object files in /usr/obj by default. For the mips64 build, this will require at least 1.3GBytes of free space. Set the MAKEOBJDIRPREFIX environment variable if you want to put them somewhere else. The script itself requires at least 2.0GBytes of temporary space to hold the installation root, UFS image, and final result image before compression. Check the temp_root setting at the top of the script, or it will all go to /tmp by default. Check that the number of jobs in the make_args setting at the top of the script is appropriate for your build machine. On success, you will have an xz-compressed image, ready to decompress and dd onto the destination. Follow the installation instructions, above. The author of this page can be reached at erl@rtfm.net.